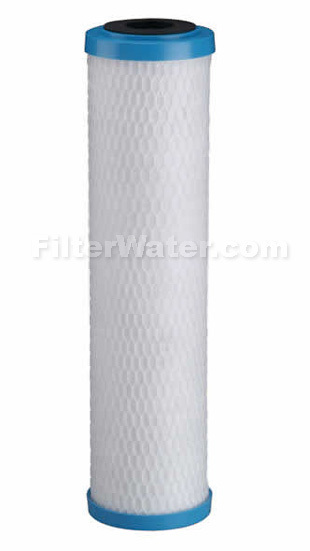 Pentek ChlorPlus 10 Chloramine removal Water Filter Cartridge is a 10"x2.5" Carbon Block 1 micron Water Filter cartridge # 255416-43 designed to remove chloramines from drinking water. ChlorPlus Water Filter is a premium, high capacity Chloramine, Taste and Odor reduction cartridge that also reduces chlorine and sediment. Cartirdge will fit any standard housings designed for 10" long x 2.5" in diameter filters, such as Countertop, Uunder Sink and Reverse Osmosis Systems. Chloramines, (also known as monochloramines ) is chlorine combined with ammonia. The chemical has become a popular alternative to free chlorine for water treatment, because it has less odor. It's a very common disinfectant in southern states such as California and Florida. 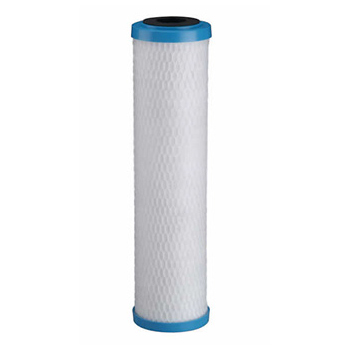 Regular carbon filters are much less effective in chloramine reduction. Check with your water company , or contact us and we'll help you identify if they use chloramines. The Pentek 20BB Chlor Plus Water Filter Cartridge is a 1 micron cartridge that is designed to removes chloramines. Pentek Carbon block Chloramine reduction cartridge also provides sediment reduction. Fits following Brands: PENTEK (formerly USFilter ), Cuno, Filterite, Keystone, U.S. Water ( US Water ), Water Resources and most Harmsco filter housings. Compatible with many other standard 10" long housings.